A yummy color challenge at the Play Date Cafe this week (PDCC36). This week's colors are courtesy of Marthastewart.com. I've never tried these colors together before but I really love them! So here's my little card. The cute little tea pots/ kettles are from the Afternoon Tea stamp set at Waltzingmouse Stamps. I just love that stamp set! I love the way Claire packs in so many useful little stamps in her sets! A little close up of the details, I added a few little seed beads to the tops of the kettles. The sentiment I printed from the computer. I just got that white frilly ribbon, so cute, I layered it on top of a bit of scalloped edged card. The red and white baker's twine I bought locally. The lovely red polka dot paper is from the Flutterbies Dots set by MKC at The Digichick. The red gingham is from the Sweet ginghams set from Cupcake Cards & Crafts. 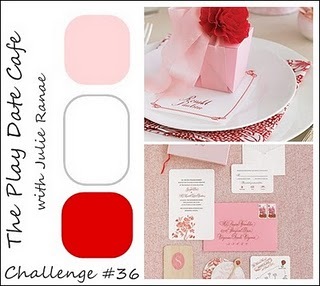 The gorgeous pale pink card is from the Mariposa Stack (DCWV). Other: Sentiment printed from the computer, selection of ribbon, lace, seed beads, button, thread, sewing machine, red and white baker's twine, scallop edge card. Sorry for the deleted coment! Your card is totally breathtaking! Love your style, it's so beautiful. Delicious colour combo, and adorable details! How pretty, wonderful embellishments. Thanks for playing at the PDCC. Beautiful card! Love the layout and the color combo. It reminds me of an ice cream shop we use to visit many years ago. They had pink and red with white awnings and gingham tablecloths inside. Thanks for bringing back a lovely memory. What a sweet card. Love the teapots. Thanks for joining us at the PDCC this week. Very pretty card! I love Walzingmouse Stamps! Love how you've done the little lids of the kettles and the baker's twine looks fab with the colour combo! Thanks for playing along with us this week at the Play Date Cafe! Oh, I love this card! How sweet! I love the sentiment and the little tea kettles are adorable. What more says 'Friendship' than tea! This is fabulous, Clare! Love the sweet tea pots.. Thanks for playing with the Play Date Cafe! !